Vivian continues to improve by leaps and bounds since returning home. It's hard to believe we just left the hospital four days ago! My friend Cynthia returned to Mississippi this afternoon. 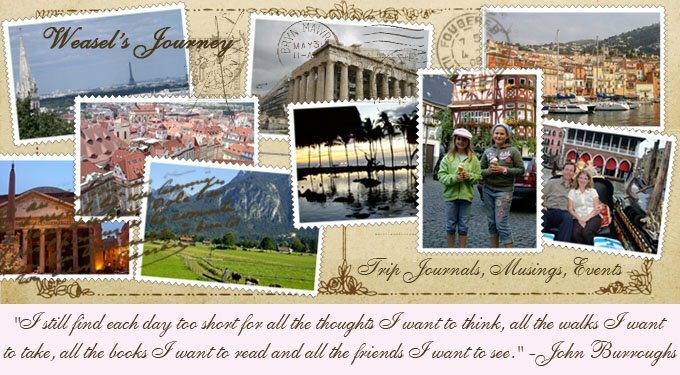 I so loved having her here and greatly appreciated her help and company. Thought I'd share a couple of cute pictures of Vivian from today. Thanks again for all of your encouragement and support. My new favorite picture of Vivian! Just a quick note to let you know how well Vivian is doing! Last night Vivian slept GREAT. Marian reported that she never heard a peep from the room above hers - hooray! Vivian has completely rejected wearing diapers, and we have had no accidents, even during the night. Today Vivian sat up in bed and colored for an hour or more in her big Rudolph coloring book. Vivian colored Rudolph's nose purple, and when Marian asked her why, Vivian giggled and replied, "I'm so silly. I'm tricking you." Later in the afternoon Vivian sat at her computer and played on PBSKids.com for a little while. Tonight Robert helped Vivian walk downstairs and out to the backyard. She rode her tricycle around the driveway a couple of times and then walked holding our dog Tucker's leash through our gate and into the front yard. All of this was with assistance for balance, but these events represent enormous progress! We are elated with the extent and pace of Vivian's recovery. My sister, Marian, returned home to Georgia this afternoon. I was terribly sad for her to leave but deeply appreciate the week she took away from her family to be here with me. 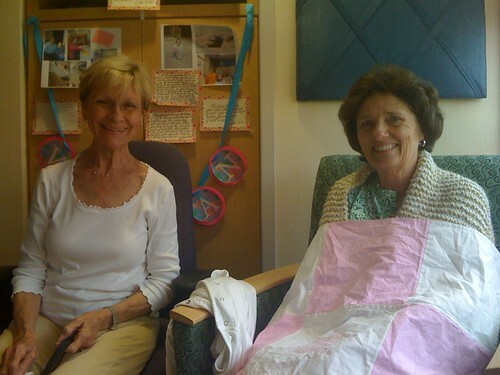 Marian was a tremendous help and comfort. My friend Cynthia arrived from Mississippi just after Marian's departure. I was delighted to see her and look forward to having her here for a few days. Praise God for the tangible improvement in Vivian's strength and balance. Praise Him that Vivian is sleeping longer and more peacefully. Praise Him that Vivian is enjoying her favorite activities again and that her funny little sense of humor has returned. Pray for Vivian to resume eating (I was not able to work with her on this today). Pray for healing for Vivian's arm. Thank you for your continued kindness. 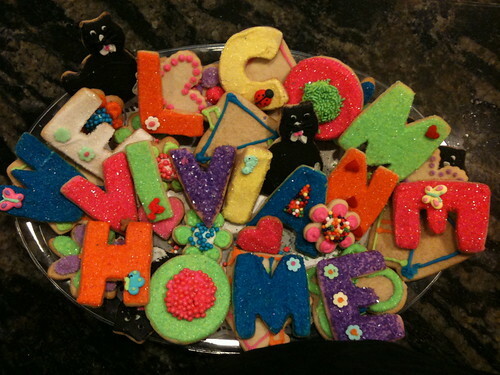 Look at the darling cookies that my friend Bonnie MADE for Vivian! 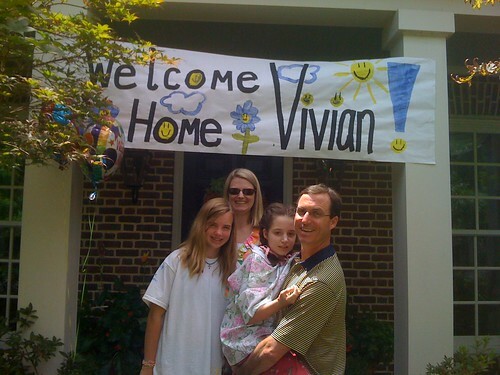 We are so glad to have Vivian home! In some ways, though, I feel like I've traded intermittent periods of intense stress for continuous stretches of milder tension. Vivian has not slept well since she's been home. Last night Vivian was particularly restless, though she didn't seem to be in pain. 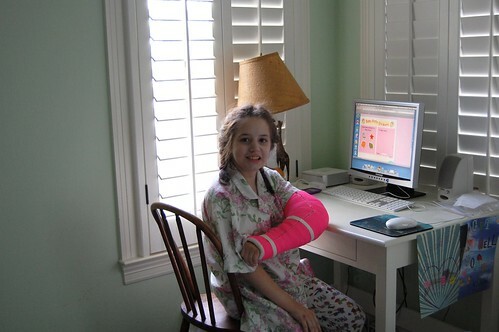 I don't think Vivian can get into a comfortable position with that huge cast on her arm, and she may also be used to people checking on her all the day and night in the ICU. I'm hopeful that Vivian's sleep habits will improve as she adjusts to being home. Vivian had a mild seizure earlier this evening. 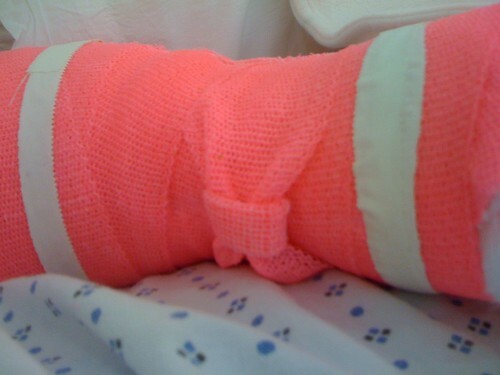 The nurse reported that it lasted about 45 seconds. Otherwise Vivian's health has been very good since returning home. I have not yet been very successful in interesting Vivian in eating regular food. She will take a couple of bites of something and then began to say "No, thank you!" and cover her mouth. Her longtime speech therapist, Melinda, suggested that we move more of Vivian's g-button feedings to the evening so that she is hungrier during the day. I'm going to try that tomorrow. I am glad to know that in the meantime Vivian can receive sufficient calories and nutrition via her button. Praise God for His faithfulness in providing for Vivian and our family. Praise Him for Vivian's miraculous recovery. Pray that any infection in Vivian's body would be wiped out by the course of antibiotics that continue for another three weeks. 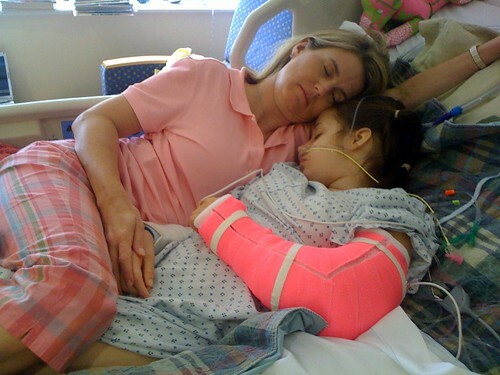 Pray that Vivian's left arm would heal and require no further surgery. Pray for Vivian's balance and strength to improve. Pray that Vivian's appetite returns. Ask God to grant patience and grace to all who care for Vivian daily. My heart overflows with love and gratitude for each of you. Fixing Vivian's hair before we head home. I watched a video on YouTube to learn how to French braid! Leaving the hospital. Vivian didn't quite know what to think! 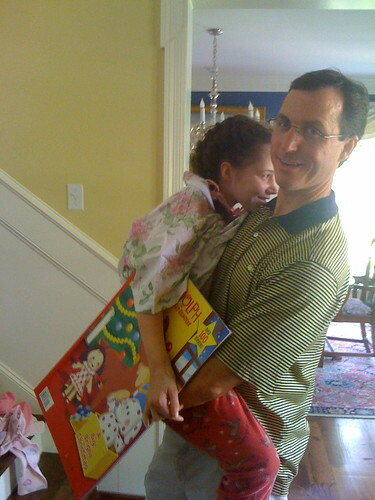 My friend Kristin dropped off this big Rudolph book. Do you think Vivian liked it? Vivian had a great day today! Later in the afternoon Robert and his mom took Vivian on a walk around the hospital in her stroller. They got Vivian to take quite a few steps from her stroller to a sofa in the lobby. Robert's mom bought Vivian a banana smoothie that she consumed happily and easily. We are all so excited about Vivian's homecoming tomorrow. I think I would have been happy at any point Vivian had been discharged, but her extra days in the hospital seem to have brought Vivian sufficiently far along in her recovery that I feel very comfortable about our ability to care for her at home. We will have some nursing help, but I hope not to need it for very long. Praise God for the miraculous progress Vivian has made. Praise Him that Vivian seems so much like her old self again. Pray for Vivian's continued recovery. Pray that Vivian's strength, balance and appetite increase. Pray for wisdom and patience for Robert, Will, Dorothy and me as we tend to Vivian's needs at home. We are very grateful for the comfort and support each of you has provided us on this journey. After a quiet night of sleep and rest, Vivian was subdued and a bit detached this morning. Denise, Vivian's physical therapist from when she was a little girl, stopped by, and we got Vivian up and in her stroller for a walk. Vivian didn't protest, but neither did she engage with her surroundings as well as she did yesterday. My sister Marian commented that she didn't think Vivian felt great this morning, that her legs were shaking as if she were still working through some withdrawal symptoms. In the afternoon Robert brought Will up to the hospital to visit Vivian, and Vivian greeted Will with a kick. Welcome back, sweet Vivian! Robert conveyed that Vivian engaged and talked more as the day went on. Vivian had a new x-ray taken of her left arm yesterday. An orthopedist met with Robert this afternoon and told him that the arm is healing well and that lots of new bone growth can be seen. This will make Vivian's arm stronger but will create a lot of stiffness that she will have to work through after her cast is removed. At this point we are not as concerned with the range of motion of Vivian's arm as we are with preventing the need for further surgery. Tonight Vivian's wonderful aide, Mr. Kemp, and his wife, Cheryl, who helps with Vivian after school, visited Vivian in the hospital. Cheryl reported that Vivian recognized them and answered their questions appropriately. 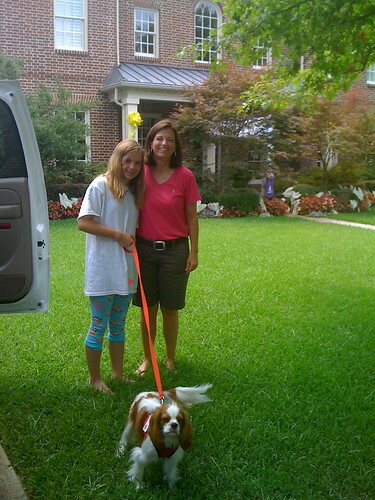 They had not seen Vivian in several weeks and were so pleased with how well she was doing. My mom left this morning to return to Jackson Hole. I was certainly sorry to see her go but greatly appreciate all of her help and support the past two and a half weeks. We remarked to each other before she left how much better things were than when she arrived! Praise God for His continued provisions for Vivian and our family. 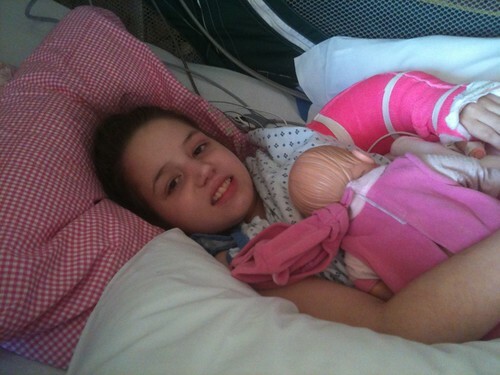 Please pray that Vivian's strength and balance would continue to improve as she gets out of bed and on her feet more. Pray that any remaining withdrawal symptoms would vanish before Vivian leaves the hospital. Pray that Vivian's doctors are able to determine the appropriate dosing for the Vancomycin (the IV antibiotic) that Vivian will receive for a few more weeks. Pray that if there is any infection in the bone or hardware in Vivian's arm, it would be addressed by this course of antibiotics. Pray for complete healing for Vivian's arm. 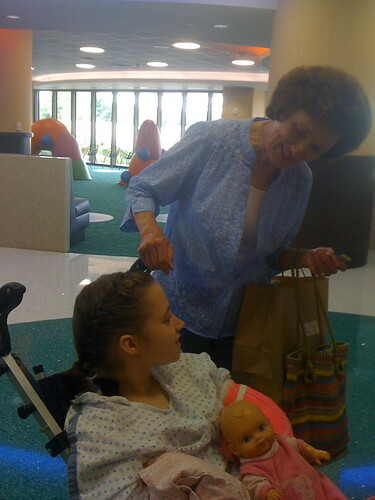 Finally pray for a smooth transition home for Vivian. Thank you for your tireless support and encouragement. We appreciate each of you very much! This morning when my mom and I arrived at the hospital, Robert had Vivian sitting in her stroller in the lobby. Vivian was watching one of her favorite episodes of Dora the Explorer on Robert's phone and was convulsed in giggles at the funny parts. I was absolutely elated to see Vivian smiling and laughing again! After spending several hours in her stroller, Vivian slept most of the afternoon. Whenever her nurse Ezy would approach to give Vivian medicine or take her vital signs, Vivian would bark, "Hey! You're waking me up!" and then immediately go back to sleep. Vivian was so calm today that we didn't have to restrain her arms, and I think that helped her to sleep well. Had today not been a Friday we likely would have been discharged from the hospital as Vivian's medical needs at this point are few. The ICU staff was hesitant to send us home over a weekend, though, in case any problems should arise, so Vivian's homecoming is set for Monday. We are so excited! Praise God that Vivian's withdrawal symptoms are virtually gone. Thank Him that Vivian has been eating and swallowing well and that she seems so much more comfortable. Pray for Vivian's strength and balance to return quickly as she has not been on her feet much over the past 29 days. Pray that Vivian's transition home would be smooth and that Robert and I would have adequate help to keep her safe and meet her needs. Pray for Will and Dorothy as they adjust to having Vivian home again and recall what it is like to have parental supervision. We appreciate each and every kind word, deed and prayer that has been offered on Vivian's behalf over the past month. I doubt that anyone has more thoughtful and generous friends and family than we do. From Robert: "Vivian is ready for her morning stroll"
Robert went up to the hospital early this morning to meet with the home nursing agency and sign some paperwork. He sent me the picture above and this text which I thought were so encouraging that I wanted to share them! Vivi had a very good night, sleeping most of the time. She ate some pudding along with her pills. They plan on Vivi being very active today. Vivian had a nice quiet day. Last night Vivian's nurse reported that she slept very little. Today, however, she rested quite well. At the risk of confusing Vivian's days and nights, I was glad Vivian was able to nap at all, as she has had very little repose during the past four days and nights. Vivian was generally very calm today; her withdrawal symptoms seemed much less obvious, apart from the occasional shaking of her legs. With Marian's help, I was able to get Vivian to walk across the room and into her stroller on several occasions. The physical therapist was quite pleased with the improvement in Vivian's balance and weight-bearing. Vivian had no hallucinatory episodes, and her eye contact was much better today. Hooray! Praise God for Vivian's continued miraculous improvement. Each ICU nurse and doctor who encounters Vivian for the first time in several days is amazed at the strides she has made. Pray that Vivian would overcome her withdrawal symptoms completely. Pray that her oral feeding and language skills would improve. Pray that Vivian would feel better overall. 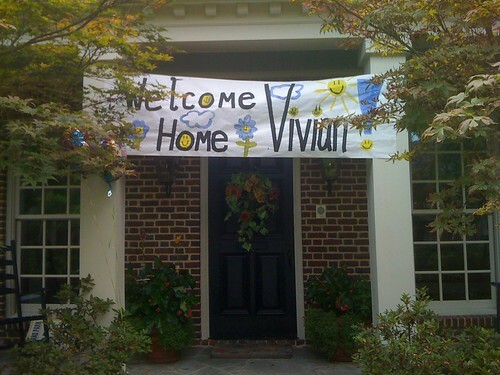 Pray that our preparations to bring Vivian home would result in a safe environment conducive to her complete recovery. Thank you for sticking with us through this ordeal! We appreciate you so much. Vivian requested her favorite doll, Sarah, before she fell asleep this afternoon. Previously Vivian had fussed, "Tell Sarah to go away!" I apologize for the late update. My sister, Marian, arrived from Georgia tonight after several delays. I am so glad she is here! Vivian continues to trend in the right direction, though she had a few rough spells today. Out of the blue this afternoon Vivian started claiming that there was a bee on her nightgown. She kept saying, "Go away, Mister Bee! Go home and see your family!" in between screaming and trying to blow or shoo him away. Her hallucinating was pretty horrible and frightening to witness, but fortunately Vivian eventually settled down. Vivian ate quite a few bites of Cream of Wheat and drank some more Sprite today. Tomorrow I am going to attempt to give Vivian a couple of her regular seizure medications orally again. Since Vivian's extended release medications cannot be crushed and given through her g-button, she is receiving the regular formulation of those four times a day, but she does not seem to be absorbing them as well. Robert took Vivian for a long walk in her stroller this morning. They left the PICU and explored the beautiful new lobby of the Children's Hospital. Robert said Vivian seemed to enjoy her outing a lot. In addition to her little excursion, Vivian spent several extended periods of time sitting in her stroller. She appears to be more relaxed and comfortable there than in her bed. Vivian's longtime neurologist, Dr. Riela, stopped by to see her and visit with Robert and me this evening. Dr. Riela was certain that most of the residual problems Vivian is experiencing relate to withdrawal from all of the medications she has taken the past 26 days (Vivian's hallucinations, insomnia, lack of eye contact, oversensitivity to light, touch and sound, and general grumpiness). He believes we will see a lot of improvement in Vivian after this withdrawal period and even more progress after we bring her home. Because of the withdrawal symptoms, however, the PICU doctors want to keep Vivian in the hospital until Monday. I was a bit distressed to hear this, but on reflection I realize it will give us time to get all of our ducks in a row regarding home health care and therapy and to get Vivian as well as possible before recommencing to care for her ourselves. Praise God for the incredible improvement Vivian has made over the past month. When I read back over my updates, every specific thing I asked you to pray for has been answered positively. Wow! Please pray that Vivian is able to resume taking her medications orally. Pray that Vivian's hallucinations end and that she is able to rest comfortably. Pray that her withdrawal symptoms wind down and that she begins to feel well again. Robert and I are greatly bolstered and encouraged by the tremendous outpouring of support we have received. Thank you so very much. I'm not sure why some days are more exhausting than others. Vivian had a good day today. The doctors have eliminated all sedatives during the day in an attempt to reestablish Vivian's day and night cycles (which have always been a bit blurred, even before this hospital stay). We were able to get Vivian into her stroller several times. We walked her around the PICU block on each occasion, and on the last Vivian sat in her stroller afterward for an extended period. Vivian took quite a few steps; she was completely supported by Robert and the physical therapist, but she was bearing her full weight on her legs. I fed Vivian half of a jar of baby applesauce, and she ate that very readily. When Vivian was in her bed, however, there was a lot of kicking and complaining. I think that Vivian is generally uncomfortable, so she asks to have her socks removed, then decides that didn't help and requests to have them put back on (same with being covered with a blanket, having someone hold her hand, etc.). Vivian hates the restraints on her hands and keeps asking us to "take off those rabbits" (I have absolutely no idea why she calls them that). Most concerning to me today was Vivian's inability to look directly at anything and focus. Vivian is able to identify things that I hold up (a stuffed Rudolph, her baby doll Sarah, etc.) so I know that she can see, she just looks past things most of the time. In general Vivian is very easily overstimulated by all of her senses (keeps saying noises hurt her ears, can't abide for even a band-aid to be on her skin, etc.) so perhaps the lack of eye contact relates to that; I don't know. Robert and I were discouraged when Dr. Fanning told us today that it would likely be the end of the week or the weekend before Vivian is discharged from the hospital. I know that being home will have an entirely new set of challenges, but I am so weary of her being in that PICU. I'm sorry to be so whiny tonight. I think I'm just tired. Please pray that Vivian would begin to make eye contact and look at things directly. Pray that Vivian continues to gain strength in her legs as we get her up and walking again. Pray that we could expand the types and amounts of food that Vivian is able to receive orally. Pray that Vivian ignores the belt protecting the g-button and port on her abdomen so that those are able to stay in place. Praise God that Vivian's latest screen for the C Diff gastrointestinal infection was negative. Praise Him for the strides that we are seeing in Vivian every day. 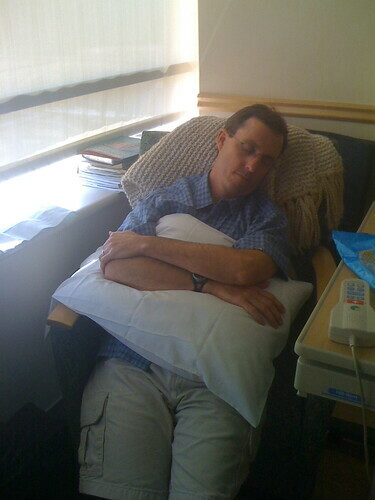 Ask Him to provide me with a new burst of energy, hope and strength (Robert, predictably, is still holding up well). Thank you for reading these updates and faithfully praying for Vivian. Your thoughts and prayers have been much needed and appreciated. Vivian was very alert today. She said "Ow" a lot, but her complaints seemed to rooted in annoyance rather than in pain. While in ICU Vivian has to have an oxygen monitor on her finger and a blood pressure cuff on her leg, and she abhors both. 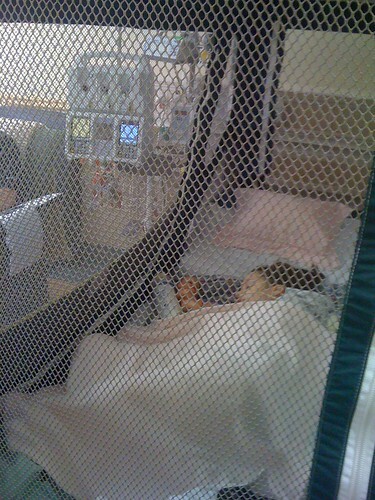 Vivian was out of bed once today for a promenade around the PICU in her stroller. Vivian seemed to enjoy her outing and fell asleep in her stroller after we returned to her room. Unfortunately when it was time for a blood draw to check on Vivian's antibiotic level, the nurse discovered that Vivian's port access had dislodged so we had to move her back into her bed for it to be replaced. Afterward it took us several hours to get Vivian to settle down and go to sleep again. The walk wore Vivian out! The orthopedist who performed Vivian's second surgery felt that an infection in the hardware in Vivian's arm could be responsible for the high fever that landed her in the ICU as well as the softening of her bones that led to the loosening of her initial surgical screws. Cultures of fluids drawn during the second surgery have not yielded any positive signs of infection, but such results could be tainted by the strong antibiotics Vivian has been receiving. 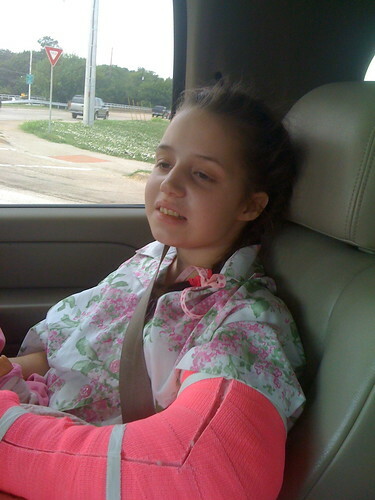 To be on the safe side, the orthopedist, in consultation with a pediatric infectious diseases specialist, wants Vivian to continue on IV antibiotics for six weeks (ugh). Vivian's doctors are trying to establish an effective dosing schedule before they discharge her. Please pray that Vivian's doctors can decide on the proper course of antibiotic therapy. Pray that Vivian would regain strength in her legs quickly as she has had little opportunity to rehabilitate them with a physical therapist while in the PICU. Pray that the C Diff gastronomical infection that Vivian previously tested positive for is gone. Pray that Robert and I are able to work with the hospital social worker to organize adequate and appropriate help for Vivian's return home; I am especially concerned that we be able to keep Vivian safe since she will not yet be steady on her feet should she decide to get out of bed. Pray that Vivian can ignore the band we have around her waist to prevent her access to her port and g-button; right now she keeps imploring us to "take off that seat belt." Praise God that Vivian's pain is abating and that her funny little personality continues to shine through her discomfort. Thank you for your diligence in praying for Vivian and encouraging Robert and me. You have made such a huge difference during this arduous journey. Being at the hospital with Vivian is exhausting! This afternoon and early evening Vivian had periods of discomfort and unrest spelled by interludes of sleep. When she was awake, Vivian would complain that her tummy hurt, likely from the surgeries of Saturday night and this morning. Vivian's sweet charge nurse, Ronelle, constructed a wrap for Vivian's waist out of a postpartum brace and some suture thread, and we put that on Vivian to prevent her from grabbing at her new g-button and port. Dr. Wick, the kind, compassionate ICU doctor today, was ardent about relieving Vivian's pain, so I am hopeful that Vivian will be able to rest tonight. When I left the hospital this evening, Vivian was sleeping quietly. Vivian's occupational therapist, Carla, who has worked with Vivian since she was two, paid a visit late this afternoon. 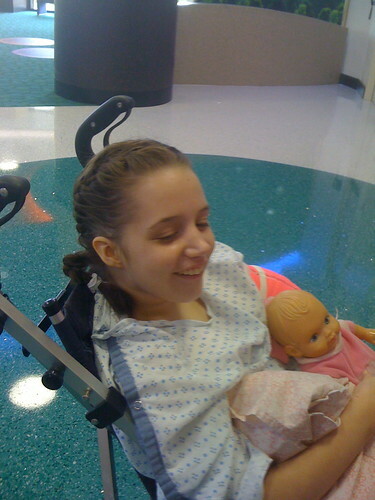 Carla had stopped by during Vivian's first week in the ICU, and she could not believe the improvement in Vivian since then. Carla talked to Vivian today and told her about her dog, Gaby. Typically when Carla arrives at our house to work with Vivian, Vivian tells her, "You need to go home and see Gaby" (i.e., you need to do something other than stay here and make me work). Today Carla told Vivian that Gaby had been chewing on her furniture. I wasn't even sure that Vivian had registered that Carla was there, but all of a sudden Vivian responded, "Gaby needs to chew on her bone." Carla and I were elated to hear Vivian say this! Clearly Vivian's memory is intact and she is making good connections. Vivian still has a number of physical challenges to overcome, but Robert and I are so heartened by all of the progress she has made. We no longer have any doubt that our sweet funny Vivian is returning to us. Today was largely a day of rest and recovery following surgery. For tomorrow please pray that Vivian's pain would be eased and that she would not be bothered by the g-button and port in her abdomen. Pray that we are able to get Vivian on her feet and walking. Pray that Vivian would resume taking some food by mouth. Praise God and thank Him for the innumerable miracles we have witnessed in Vivian over the past three weeks. Vivian continues to amaze everyone with how she has rebounded from being so very ill. Your support and prayers have ministered to our family immensely. We will never be able to adequately express our appreciation. Vivian's surgical procedures went very well this morning. Dr. Roden replaced the gastric tube formerly in Vivian's abdomen with a g-button. I'm not sure why previously Vivian was unable to receive the button for six weeks; I had understood it was because of the more durable approach the surgeon had chosen, but I am certainly glad that someone decided we no longer had to wait so long. The new button is much less obtrusive and cumbersome than the six-inch protruding foley catheter tube with its requisite clamp. Vivian's port is in place under the skin on the opposite side of her abdomen. Vivian will be able to receive IV fluids and antibiotics there, and the nurses can use the port for routine blood draws. Hopefully we will cover the g-button and the port such that Vivian doesn't notice or bother with them. I believe the plan today is to keep Vivian sedated so that she is quiet and comfortable during her recovery. Dr. Wick would like to introduce some clear broths and liquids to Vivian this afternoon and see how Vivian tolerates swallowing and receiving them. If Vivian handles those well, we can progress to other fare. I would like to feed Vivian some Cream of Wheat as that's one of her favorite foods at home. This morning's surgeries were such minor setbacks compared to how far Vivian has come. We are elated beyond words at the prospect that our sweet, funny, little Vivian is returning to us. I am certain that her teachers and others who know Vivian well are not one bit surprised at the curveballs the real Vivian is throwing at the nurses and doctors right now! How can I ever thank you enough for praying, crying, laughing and celebrating with us on this journey? Praise God for Vivian who continues to bless us all with joy and adventure. Robert received a call from Dr. Fanning around 11 o'clock last night reporting that Vivian had pulled the new g-tube out of her stomach when the nurse was away from the room. Robert said that Dr. Fanning seemed very embarrassed that this had happened, especially since the same nurse was on watch the night before when Vivian yanked the PICC line out. In my distress I took an Ambien to go back to sleep and completely missed Dr. Fanning's subsequent phone call at 5 o'clock informing us that the surgery to replace the g-tube and to insert a port would commence in a few hours. I evidently had a conversation immediately afterward with Robert, but I have absolutely no recollection of it. Robert has been up a the hospital for a while. I am going to join him now. Please pray that the procedures go well and that each necessary device stays in place this time. Pray that the doctors and nurses would be enlightened as to Vivian's resourcefulness (my mother calls her "Houdini") and would be proactive in outsmarting Vivian and preventing her access to the hardware on her body. I will report more later. Predictably, as Vivian reverts more to her former self, Robert and I are encouraged, but Vivian creates additional challenges for the PICU staff. Vivian's hands are restrained, but last night she succeeded in using her teeth to pull her PICC line out of her upper arm. This was not good because the PICC line involved a bedside, sonogram-guided procedure under sedation to insert and Vivian needed the line to receive IV fluids and antibiotics. I have to credit Vivian for her resourcefulness, though! The night nurse put an IV in Vivian's hand as a temporary replacement, and the PICU doctor today, Dr. Wick, determined that the best longtime solution would be a port, which a surgeon will place under Vivian's skin on Monday. Vivian was increasingly verbal today. The nurse reported that Vivian frequently requested to go home last night. Today Vivian told us she was hungry, and she exclaimed, "Help me!" several times as she struggled against her restraints. 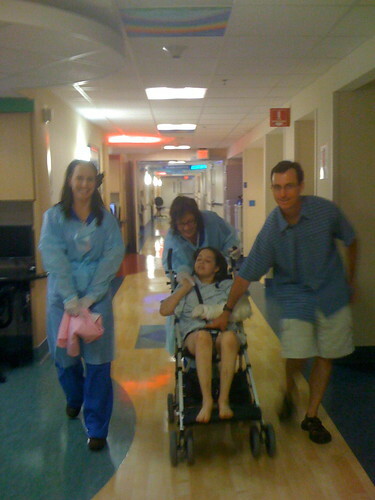 The nurses and Robert lifted Vivian into her stroller this afternoon, and we walked her around the PICU "block." As we passed a book cart, I spied a copy of one of Vivian's favorites, Five Little Monkeys Jumping on the Bed. 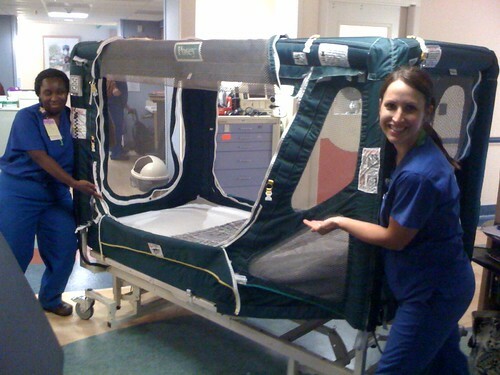 I grabbed it for her, and the charge nurse, Ronelle, began to recite, "Five little monkeys jumping on the bed. One fell off and bumped his head." Vivian didn't seem to be paying any attention so Ronelle paused. All of a sudden we heard Vivian say, "Mama called the doctor and the doctor said, 'No more monkeys jumping on the bed.'" We were ecstatically astounded! After we returned Vivian to her bed, she was exhausted from her brief outing, but I was able to capture a little bit of Vivian reciting the verse again on video. Robert reported that Vivian was a bit restless this afternoon and kept requesting that he "buckle her seatbelt." Robert told me he leaned over her and pretended to buckle her in and that she then told him "thank you" and settled in for a few minutes before appealing for him to do it again. Vivian is not happy about the tube in her stomach from yesterday's surgery (which I learned will not be replaced with a button for six weeks - ugh!). Right now she is restrained from being able to grab it, but we are going to have to figure out a new system if it's going to last that long; my mother suggested we tie a corset over it! Please pray that Vivian's IV in her hand would remain in place and functional until we can get a port in place. Pray that Vivian would be less aware and more tolerant of the feeding tube in her abdomen. Pray that the incision from yesterday's procedure would heal and not cause Vivian pain and discomfort. Praise God for the truly amazing progress we have observed in the past couple of days and for the added strength and encouragement such gains have given Robert and me. We appreciate each of you so much! ...here is a nutshell version of the recent saga regarding our daughter Vivian. 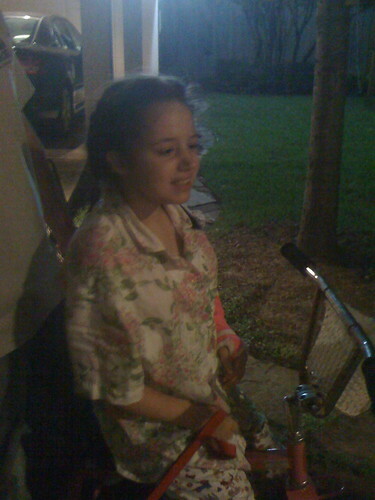 Vivian broke her arm on June 22nd, her 16th birthday. 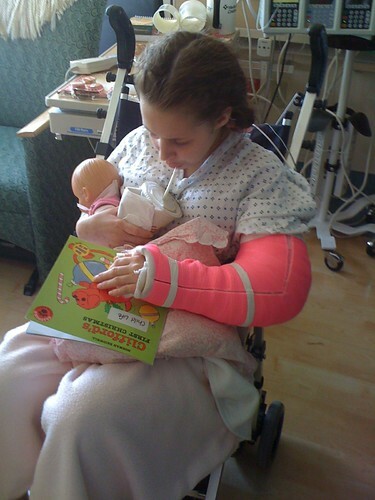 She had surgery to repair her arm the following day. Two days later Vivian ended up in the emergency room with a fever of 107° and pneumonia in both lungs. 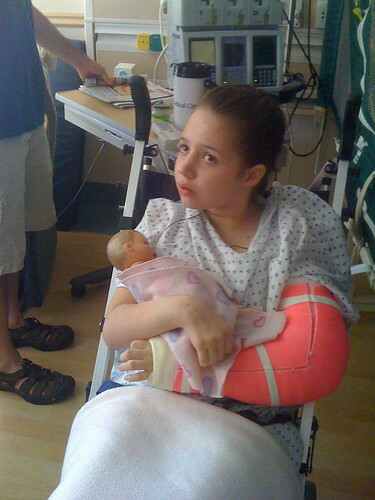 We're not sure if or how that event related to her arm surgery, but Vivian has been in the pediatric ICU for 23 days. 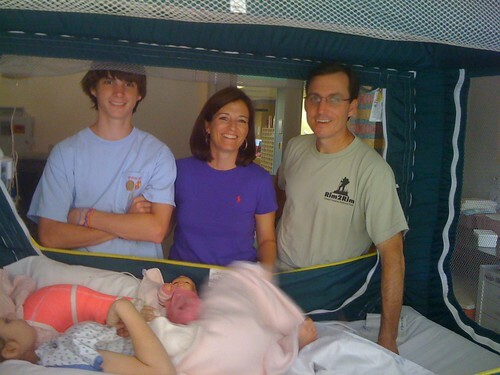 Vivian was on a ventilator for 12 days. 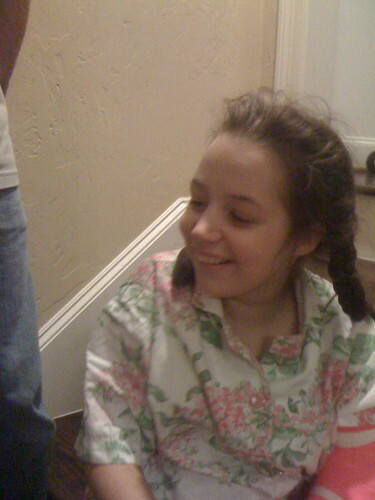 There was concern that Vivian might have suffered brain injury, but an MRI last week showed no abnormalities (hooray!). On July 10th Vivian's arm needed additional surgery because the large screw that repaired it had come loose. On July 16th Vivian had surgery to insert a gastric button in her abdomen so that she could receive her medications and nutrition until she is able to reestablish taking them orally. Just in the last few days Vivian has made significant cognitive improvements, and we feel encouraged about her ability to recover. We covet and appreciate your prayers for her! For more about Vivian, click here. 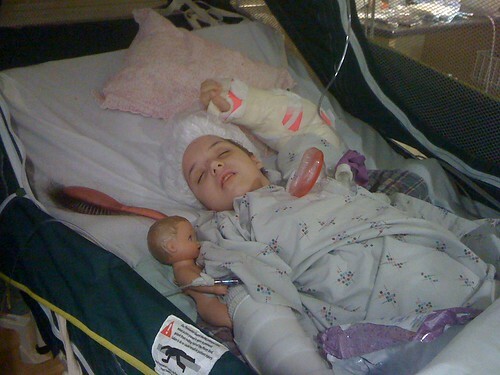 The operating room was backed up, so Vivian didn't go into surgery until close to 6:15. 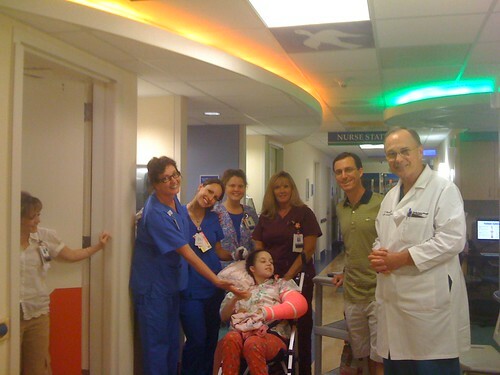 The procedure went very well, and Vivian was back in her room around 7 o'clock (ICU patients bypass the recovery room). The surgeon elected to perform a more "durable" version of the surgery. I can't imagine what made him think that was necessary! I'm a little concerned about how Vivian will do when she wakes up now that she's more aware of where she is. Please pray that Vivian will remain somewhat calm until we can go home and that she will not succeed in pulling out her PICC line or the new contraption in her stomach. 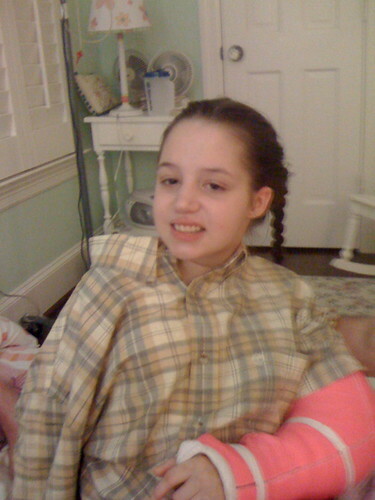 Pray that Vivian's speech and oral motor skills continue to improve. Praise God for the miracles we have seen in Vivian. Her recovery thus far is truly a testament to the power of prayer. Robert and I are so very grateful. After sleeping most of the day, Vivian woke up and said very plainly, "I don't like this place!" As anyone who knows her can attest, that is a very Vivian thing to say! Vivian loves her new bed! Carmen, her nurse for the past two nights, could not believe how much better Vivian slept and behaved last night than the previous night in her old bed. Carmen also reported that Vivian spoke to her several times, though the day nurse who relayed that information did not know what Vivian had said. Vivian did well during her upper GI test this morning, and she is scheduled for minor surgery to insert the g-button in her abdomen at 4:30 this afternoon. The procedure is expected to last less than an hour. Please pray that it goes well and that Vivian is so happy to have the n-g tube removed from her nose that she doesn't bother with the new accessory on her tummy. Vivian has been asleep throughout our visit today; we are pleased that she is resting peacefully. I know that everyone is ready for a good update (and believe me, I am more than ready to write one! ), and I am happy to report that today was a step in the right direction for Vivian. 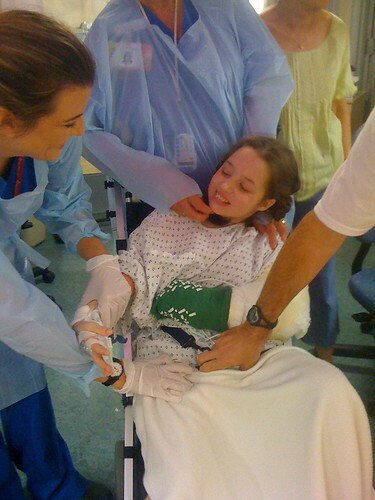 Vivian had an extended EEG today which precluded the upper GI from being performed. 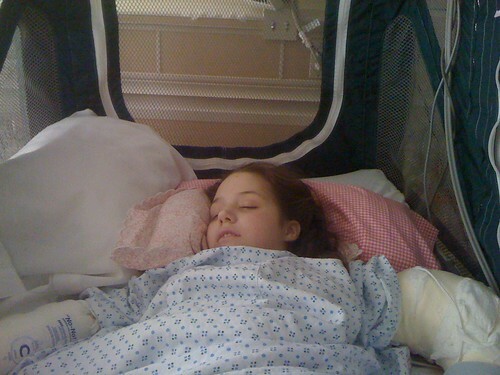 When I arrived at the hospital, all of Vivian's electrodes were in place on her head and she was sleeping soundly. Robert and his mom had been there when the technician prepared Vivian for the test (my mom and I went to a parent observation at Dorothy's dance camp), and they reported that Vivian slept through the whole process and thus was cooperative! Evidently Vivian did not sleep much at all for her nurse last night; ergo, she was pretty worn out today. I worried that this meant the neurologist would not get an accurate picture of Vivian's alert brain on the EEG, but eventually Vivian did wake up a couple of hours into the test and was quite active. We didn't observe much of the twitching that had previously concerned us; perhaps it has responded to the boosts in her seizure medications. Vivian, however, was increasingly interactive, if still far from her previous mental state. Vivian told us at one point that she was thirsty, and when Robert asked what she would like, Vivian replied, "Sprite, please." The nurse and physical therapist were so impressed with her good manners! When Vivian indicated a desire to get out of bed, we lifted her into her stroller. This time Vivian sat pretty well there for about ten minutes (with four of us surrounding and supporting her lest she arch her back or otherwise attempt to get out). At one point Vivian said pretty plainly, "I need to go to the bathroom." We were not able to accommodate her because she required too many of us to support her, but we were thrilled that Vivian was able to express this. Enunciating these phrases takes much effort and time on Vivian's part; she does not in any way speak with the ease she previously communicated, but we were very encouraged to hear her talking and saying more. Vivian has made a mess of her legs and knees in her flailing around and attempting to break free from her bed. The charge nurse today persisted in locating a bed that could restrain Vivian without the hard rails that were causing gashes and sores on her legs. We are thankful to this nurse, Terry, for her diligence on Vivian's behalf, as Robert's Eagle Scout skills were maxed out in attempts to pad the bed and the rails with blankets tied with fancy knots. Tomorrow morning Vivian will have her upper GI test, and in the afternoon a surgeon will perform the procedure to insert the g-button for Vivian to receive her nutrition and medication. We are looking forward to removing the N-G tube from Vivian's nose as it is a persistent annoyance to her. This afternoon Robert met with the hospital social worker to talk about plans for bringing Vivian home. There is much to coordinate in terms of determining insurance coverage and Vivian's needs, but this was a good initial step. I think it will still be early next week before Vivian is discharged from the hospital, but we are making progress in that direction. Robert and I were encouraged by what we saw with Vivian this afternoon. We have a long way to go but are for the first time feeling somewhat optimistic that we can get there. Please pray that Vivian's g-button procedure goes smoothly tomorrow and that she once again tolerates the necessary anesthesia. Pray that the EEG yields some useful information. Pray that Vivian's speech, eating and swallowing skills continue to progress. 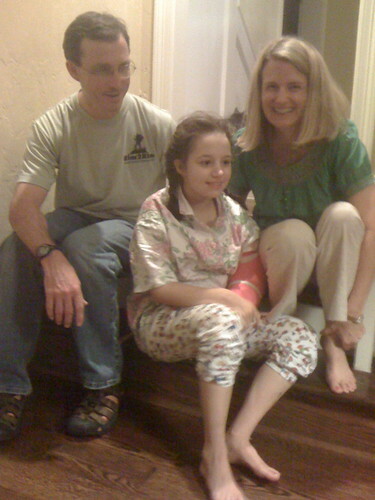 Pray also that Vivian regains the necessary motor skills to walk and care for herself again. Praise God for the encouraging signs we are observing and for His continuing provisions for Vivian and for our family. 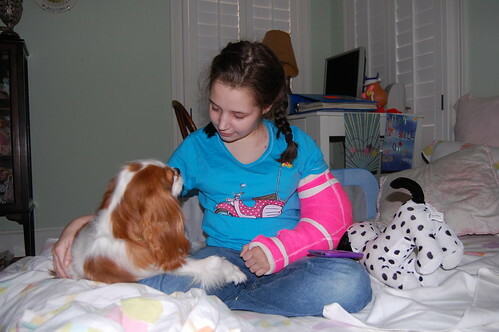 While Vivian was still under the sedation from her MRI, a peripheral intravenous central catheter (PICC line) was inserted in her right arm and the central line was removed from Vivian's chest. The PICC line will be similarly used for Vivian's IV fluids and medications, but it carries less risk of infection at this point. Tomorrow morning Vivian will have an upper GI test in preparation for the placement of a g-button on Friday. Vivian was not able to eat anything in anticipation of being sedated for the MRI so we've not been able to further assess her ability to swallow and eat. The g-button will allow Vivian to receive her medications and nutrition while we reestablish her oral routines. After the MRI this afternoon Vivian was awake and active but much less agitated than yesterday. She is exhibiting, however, a persistent rhythmic twitch in her face and hands that seems to keep her awake and interfere with her ability to speak. Today this twitching episode went on for four hours until Vivian finally fell asleep. Dr. Matson is going to increase Vivian's Keppra dose even more, and we hope it will address this issue. I just spoke to Dr. Riela's associate who called on Vivian at the hospital tonight. He had ordered bloodwork this morning to check on the levels of Vivian's regular seizure medications. One of Vivian's longtime medications, Depakote, was surprisingly low; it had been at a desirable level of 90-something the week before Vivian ended up in the hospital and today the level was 12. The neurologist is going to increase that medication as well, and I am so hopeful that the rise in either the Keppra or the Depakote or both will settle Vivian's sweet little brain. The way that Vivian stares blankly into space and her difficulty speaking remind me so much of how she acts after a seizure. I am cautiously optimistic that when Vivian's brain is calm again, she will begin to respond and act as she did before. The neurologist told me tonight that when no stroke or lesions are observed in an MRI, there is good reason to believe the person will recover neurological function. 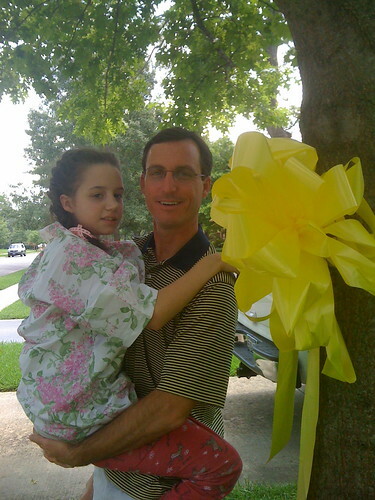 Please join me in praising God that Vivian did not suffer a significant brain injury during her high fever. Offer praise that Vivian was calmer and less agitated today. Pray that whatever is causing Vivian to twitch will cease and that she will begin to speak and interact with us again. Pray for Robert and me as we begin to prepare to bring Vivian home as there will be significant details and accommodations to be made in order to accomplish that. Thank you for loving and supporting Robert and me through some very dark days and for celebrating with us when things have gone well. We still have a long way to go. Please don't stop praying for Vivian yet. We need you. We have been waiting all afternoon for a report on Vivian's MRI, and Dr. Matson just came in and told us that it showed no abnormalities! Praise God for some good news! We are leaving to go home now, and I will update a little more later. When Robert and I arrived at the hospital this morning, Vivian's wonderful nurse Pam reported that Vivian had had a much better night. Vivian still had episodes of agitation, but they were milder and Vivian calmed down much more quickly than in the past few days. Robert and I noticed immediately that Vivian seemed more alert and a bit more tranquil. 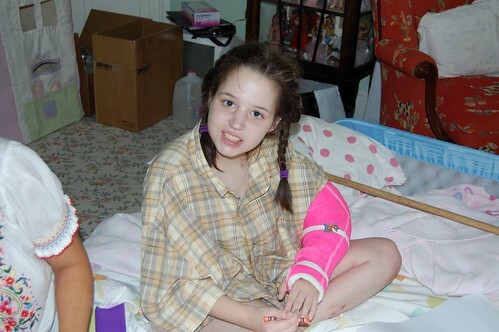 We are hopeful that this is a result of the increase in one of her seizures medications (Keppra). Pam reported that the bloodwork the neurologist ordered this morning to check on the levels of Vivian's regular medications indicated that one of them (Depakote) was also low. The neurologist will have to review the numbers, but perhaps an adjustment in that medication will yield further improvement. Vivian's MRI is scheduled for noon today. Please pray that it shows Vivian's brain is completely undamaged. I will try to update again later this afternoon. I really should have written at least five updates today as we dealt with so many different scenarios. When my mom and I arrived at the hospital this morning, Robert was already with Vivian, and our dear friend Lant from Birmingham was visiting with him, having come through Dallas for business. Vivian was having an agitated episode, so I climbed in bed with her but was unable to quiet or console her. It is very difficult to see Vivian this way as she seems nothing like her real self. Vivian eventually settled down and went to sleep, and I was sorry that Lant was not able to observe her then. Later this morning Dr. Matson met with Robert and my mom and me to discuss the state of affairs with Vivian. I was so rattled from the morning episode with Vivian that I almost skipped out on the meeting out of complete fear and dread. Dr. Matson, however, was so calm and compassionate that I left our conference feeling much better. Essentially Dr. Matson told us that he thought Vivian would be best served receiving intensive therapy at home when she is discharged and that she would also be provided full-time home health care. We discussed what steps Vivian needed to accomplish before she could leave the hospital and attempted to formulate a plan to address these. Dr. Matson also emphasized that it would be several months before we would know what Vivian's new "baseline" was going to be, that time and rehabilitation could bring all manner of improvement. 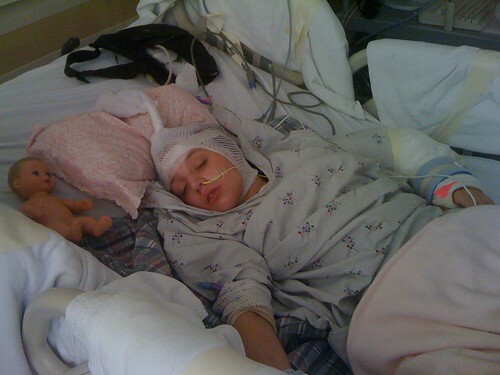 This afternoon Vivian had an EEG to check for epileptic or other abnormal waves in her brain. She was initially very uncooperative with the technician about having her head measured and marked and scores of electrodes glued all over her scalp. 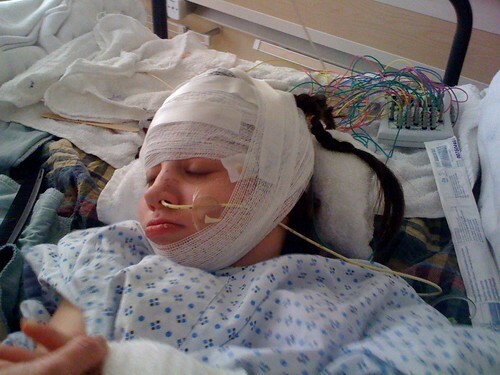 Eventually, though, Vivian fell asleep and the technician was able to administer the EEG. Dr. Matson spoke with Dr. Riela's associate tonight who had reviewed the EEG. He reported that while no epileptic activity was noted, there were large spikes in the activity in Vivian's frontal lobe. Abnormal activity in Vivian's frontal lobe had previously been associated with a marked regression in her behavior, so the doctor increased one of Vivian's seizure medications in an attempt to address this. Vivian is highly bothered by the feeding tube in her nose. She refuses, however, to cooperate enough with a swallow test for us to feel that we could remove it and give her all nourishment and medication orally. We have decided to have a g-button inserted in Vivian's abdomen so that she can receive her feedings and seizure medications through that if we are unable to administrate them by mouth. I don't view this as a setback but rather as a good thing that will enable us to eliminate one of Vivian's major irritants. Most distressing today were multiple extended episodes of thrashing and agitation. Robert has been saying he thought these episodes were some sort of seizure, and today one of Vivian's nurses said she was thinking the same thing. Unfortunately, Vivian did not experience one of these events during her EEG so I think Dr. Matson is going to order an additional EEG that will be for an extended period (probably 24 hours). At this point we are so eager for some relief and some answers that we are willing to subject Vivian and ourselves to just about anything. When we met with Dr. Matson this evening about the results of the EEG, he told us he had really pushed the neurologist about finding some medication to help Vivian. Dr. Matson told him that Vivian needs to get out of the PICU before she catches something and gets sick again, but that she currently is "unmanageable" and cannot be released either home or to rehab in her current state. We were relieved that Dr. Matson was looking out for Vivian's needs and ours so well. Robert and I have had a long standing joke that if either of us ever leaves, that person has to take Vivian with them. Today during a particularly exhausting episode, I turned to Robert and said, "If you leave, I'm going with you." We both are acutely aware of our need for each other right now. I am so grateful to have Robert at my side through this ordeal. I am particularly thankful to Robert's colleagues at Saxon/Morgan Stanley who have enabled him to be away from work these past three weeks. Tomorrow is a big day. We anticipate having an MRI as well as procedures to insert a g-button and a PICC line (to replace Vivian's central line). Please pray that each of those events goes well and that Vivian tolerates the necessary anesthesia. 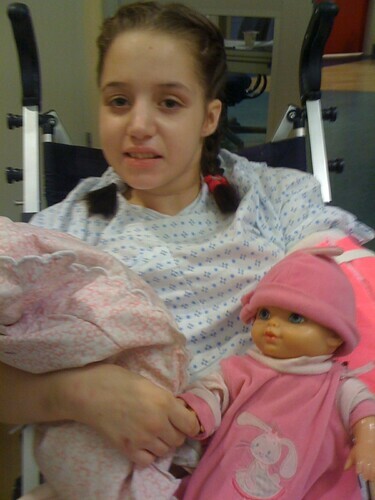 Pray that Vivian's neurologists can identity the source of her agitation and successfully treat it with medication. 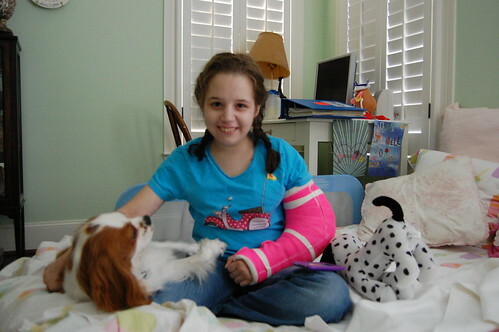 Pray that the MRI shows no brain injury from the shock that Vivian endured. Praise God for the strength that He has given Robert and me, for the presence and support of our mothers, for the many delicious meals and other provisions our wonderful friends have brought and for the balance and joy that Will and Dorothy give us. We love and appreciate each of you. Vivian alternated between wakeful periods of agitation and peaceful interludes of sleep. The wakeful periods required that Robert or I lie next to Vivian and hold her hands and restrain her legs. The times of sleep demanded that we not move from our position next to her lest she awaken. When Vivian was awake Robert and I tried to sit her up and get her to interact with us, but that was maddeningly difficult and disheartening. Vivian could utter a word or two, but it took much prompting and waiting to elicit a response. On the bright side, Vivian understood much more than she was able to express. She even turned her head toward me and touched my cheek with her lips when I asked her to give me a kiss. Vivian was able to swallow a few sips of ice water through a straw and she ate a single bite of yogurt. After that, though, she clamped her mouth shut as tightly as she could and shook her head "no" when we tried to get her to open up. Trying to get Vivian into her stroller did not go very well. She was very, very wobbly when we try to sit her up and once we transferred her to the stroller, she arched her back and wouldn't sit in it, so we had to return her to the bed. Robert reported that tonight he put Vivian's physical therapy boots on her feet for several hours. Vivian tolerated them while she slept, but when she woke up, she began grabbing at them and thrashing around. Robert asked her what was wrong, and Vivian replied, "Take them off!" I don't know what to think at this point. I am alarmed by some of Vivian's behaviors but mildly encouraged by others. Progress with Vivian is always painfully slow, so I likely would not be as apprehensive about the pace of things if her doctors weren't so concerned. I am desperate to be out of that PICU, but I don't see how we could manage Vivian at home or in rehab if we don't get her agitation and unrest under control. Please pray for comfort and peace for Vivian. Pray that Vivian's speech and motor skills would show marked improvement. Pray that the C. Diff infection in Vivian's GI tract would clear up. Pray for healing for Vivian's brain. Lastly ask God to continue to give Robert and me strength and peace that we might be equipped for the tasks ahead of us. Have I ever liked roller coasters? That answer would be "no." So would someone please put me back on the Peter Pan ride or the carousel? This morning we were caught off guard when Dr. Matson told us that he had been on the phone with one of Dr. Riela's associates (Vivian's neurologist is out of town this week) and that there was concern that Vivian had not woken up more or made more progress. The two of them thought it would be prudent to have an MRI done on Vivian to rule out the possibility that she'd suffered a stroke or other injury to her brain. Of course my instinct was to run for the nearest corner and curl up in a ball, but Robert calmly explained to Dr. Matson the positive signs he'd observed yesterday and said that he felt that the reemergence of the pain from Vivian's arm injury had interfered with her recovery and that now we were beginning to catch glimpses of the Vivian we know. Dr. Matson seemed surprised and encouraged by this news and decided to postpone the MRI to Wednesday to see how things progress in the next day or two. From where I sit, it seems that each time Vivian has started to rouse, she has been so agitated about the tubes in her body and the restraints on her arm (not to mention finding herself wearing a diaper when she so prides herself on being a "big girl") that we've had to administer sedatives. Perhaps Vivian is more sedated than she should be given what she's receiving, but I don't believe we've been able to see a clear picture of her yet because of the medications. One very positive development: as of this morning Vivian is completely off of all oxygen and is breathing successfully on her own! That is most welcome news. A representative from the children's rehab facility met with us this morning for an intake evaluation on Vivian. She mentioned the possibility of Vivian receiving intensive therapy at their facility during the day but returning home at night. I was elated to hear of that prospect because I'm convinced Vivian's agitation could be assauged if we could just get her back home in her own room, which for Vivian is akin to throwing Brer Rabbit in the briar patch. A speech therapist is going to perform a swallow evaluation on Vivian this morning to determine if we can begin trying to get her to eat and drink again. A physical therapist is coming at 11:30 to try to get Vivian into her beloved stroller to see how she responds to that. Please join me in praying that Vivian shows great progress today and tomorrow, that she passes her swallow study with flying colors and that she finds comfort in being in her stroller again. To God be the glory. Close-up of the bow Dr. Brown made on Vivian's new *cactus* (Vivian's term for cast). The good news: we are seeing more and more of the "real Vivian" emerging from our little Sleeping Beauty. The bad news: the "real Vivian" dislikes every aspect of being in the PICU and is making life difficult for her nurses and caregivers! Vivian has clearly been in less pain after her new arm surgery than during the past several days. Robert and I are so relieved because we had been insisting Vivian was still in pain, while the doctors thought her arm should not still be hurting excessively and that her agitation was likely due to withdrawal from narcotics. Today the chief sources of Vivian's discomfort have been soiled diapers and tubes in her nose. When she wakes up, Vivian begins to rip at her diaper and attempts (occasionally successfully) to yank out her oxygen and feeding tubes. My solution to this has been to climb in bed next to Vivian and throw my legs over hers and hold on to her hands; this approach has worked pretty well for me. This afternoon, however, after I'd had enough and had retreated home for a nap, Robert attempted the same maneuver during one of Vivian's fussy spells, and she plainly said to him, "GET OFF ME." Robert relayed to me that he had never been so happy to hear Vivian defy him! Vivian also gave appropriate answers to simple questions that Robert asked her over the course of the afternoon, and she settled down while listening to her favorite movie, Dumbo, on her headphones. Overall we feel very positive about Vivian's mental state. A couple of specific prayer requests: Vivian tested positive for a gastrointestinal bug called C. Diff; please pray that would clear up quickly. 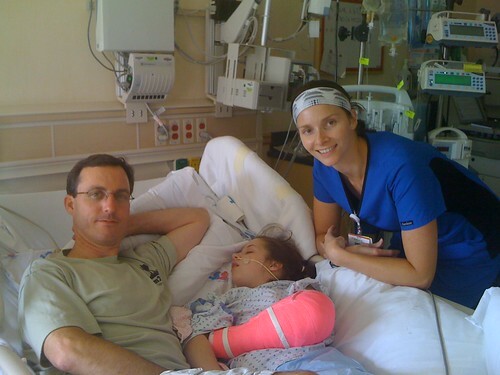 Pray that Vivian's arm would heal and that she would not work the hardware loose again in her agitation. Pray that the fluid remaining in Vivian's lungs would continue to dissipate and that she could be weaned off the oxygen she is still receiving via a nasal canula. Most of all, please ask the Lord for healing for Vivian's brain. As I sit beside Vivian's bed tonight, she is resting very peacefully while a respiratory therapist administers a breathing treatment. I think Vivian wore herself out during the long afternoon that Robert was here with her. I plan to stay just an hour or so more before going home for the night. It is impossible to adequately express our appreciation for your prayers and support throughout the 17 days Vivian has been in the PICU, so I will simply say "thank you."